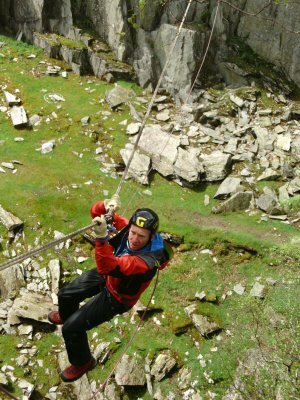 A Tyrolean traverse or zip-line is suitable for groups of all abilities and ages and gives an exhilarating yet extremely safe experience. We can either set this up as a line spanning a deep quarry or river that requires a hand over hand technique (Tyrolean traverse) to move across whilst safely secured to the line with a harness and sling set up, or we can create a descending line (Zip-line) that lets gravity do the moving while you sit in your harness and hold on. When not on the line we are all close by giving a very social and fun activity for groups. Thorough briefs and demonstrations will be given buy our qualified instructors who will be at hand to help out and watch over all aspects of the activity and guide everyone individually through the techniques required for a smooth traverse or ‘zip’ down the line. We offer this activity as either a full day option, a half day option, or as part of one of our Multi Activity Day options, it works particularly well when combined with an Abseiling session to create a multi challenge activity.